A mild, smooth soap for sensitive skin (but still be sure to keep it out of the eyes). 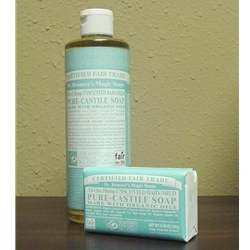 Dr. Bronner's unscented baby-mild contains no fragrance, so it is great for people who have allergies or sensitive skin. Of course, it is great for babies as well. - All oils and essential oils are certified organic by the National Organic Standards Program.